My Mother's Day machine, a White 626, a Japanese made zig zag machine. 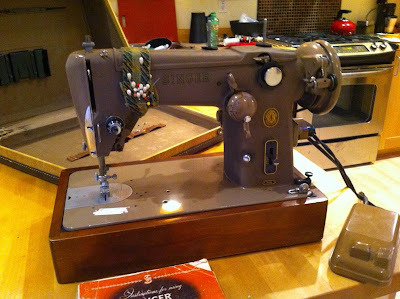 On Mother's Day last year, I was enjoying a cup of coffee, and cruising Craigslist for sewing machines. I often start with our local list, which usually has only a few recent Singers, and a few overpriced antiques. But there was a White sewing machine, in a cabinet, for only $25, in my town. A quick phone call, and my husband and I were off to find the house in a rural area near us. He was chuckling as we went on our adventure, as I have drug him off in the past to rescue a loom from a barn, and another time we rented a van to bring home a loom from a nearby city. Now that I am not weaving, but focused on sewing, I think he enjoys finding and helping me fix the machines as much as he did the looms. It's a White 626, in a lovely peach and silver two tone. This is one of the machines made post world war II, still all metal, made in Japan. After the war many factories started producing sewing machines, and they are widely believed to be great workhorse machines. Google wasn't very helpful with info on this machine, there is a video demonstrating it on youtube by niftythriftygirl, and she states that it is the first one she's seen. I did find someone else on a yahoo group who had one, but that's about it. Not very common. I did get a manual at the Singer site, http://www.singerco.com/support/instruction-manuals The trick with White machines is that you put a W in front of the model number, so w626 yielded a manual. Not that it was strictly necessary, the function is straight forward and the same as the machines I learned to sew on in the 60s and 70s. The woman I purchased this from said it was her mom's, and was purchased in 1962. 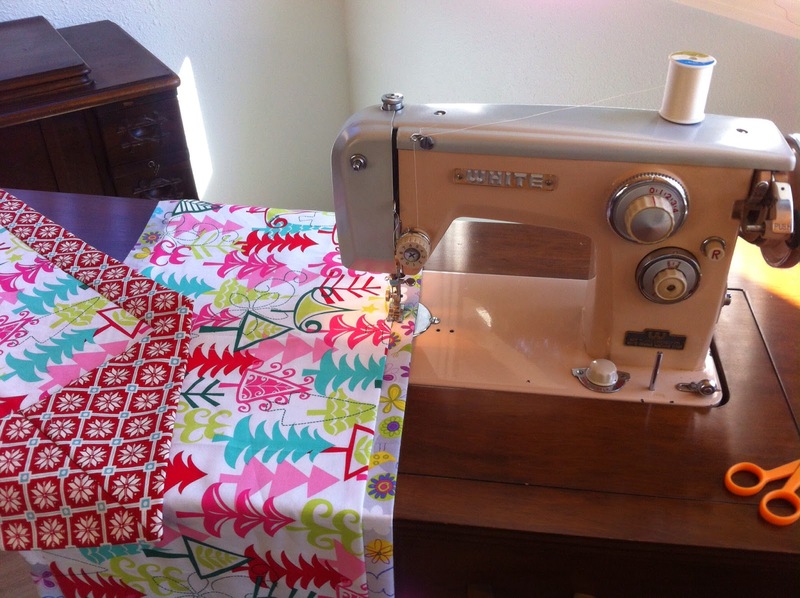 She remembers the year because her mom also bought her a sewing machine at the same time as a wedding present. She is keeping hers, but doesn't need two machines as her mom is no longer with us. The only problem she ever had with it was a broken belt, but she was able to buy a replacement at the local fabric store. but I do like that it is in a cabinet, makes it so easy to use. It has a knee lever, which I learned on so that doesn't bother me. The machine was a bit dirty, and I had to fiddle with the tension a bit. It has a left needle position, so when it is straight stitching it sits to the left of the feed dogs, this makes it tough to piece a quilt with 1/4 seam allowances. But if you wanted to quilt with it, the feed dogs drop all the way, or part way so you could do free motion quilting or darning. I haven't really played with that, so far I have enjoyed it for regular project sewing, a little dress, some table runners, things that are handy to have the zig zag as well as the straight stitch. I have a modern machine with these capabilities, but this is much more intuitive to use than remembering to push the right buttons and listen to the beep noises. And the cabinet is much more comfortable than the dining room table. When you bring one home, also grab some baby wipes and some good sewing machine oil. Wipe down the machine, open up the bobbin area and clean out lint and thread bits, and oil according to the manual. Chances are you will be ready to sew. Remember my husband from our trip to pick it up? He hasn't used this but is very attached to this machine, when I have talked about getting rid of a few machines he always says we have to keep this one. My mom had a White, I bought it from the daughter of the original owner, and on Mother's Day. Next Wednesday, a couple of 3/4 sized machines. My first treadle, A White Family Rotary. I've always kind of wanted a treadle sewing machine. I used to see them in antique stores and drool over the lovely decals and wooden cabinets. At the time I only thought they would be lovely decorations, I even liked the tables with sewing machine irons for legs. (I have since learned better, more on that later). So then my itch to get my own was even stronger. Soon I found a treadle machine on eBay that was close enough to pick up. I was the only bidder, and soon it was mine. 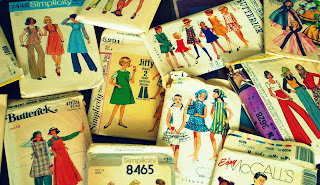 company-history.html and as always Treadle On has some great information .http://www.treadleon.net/WhiteSM/whites.html. A White sewing machine expert was able to give me a manufacturing date from the serial number, my machine was made in 1927. But before I could get sewing, I had to do a little restoration work. A bit of wood glue and a clamp took care of the drawer, and I freshened up the cabinet with Howard's Restore-a-finish. This is a great product to use on cabinets with a few dings and scratches, it may not completely remove them but it sure makes it look better and is much less work than full on refinishing. My husband teases me as I have the Howard's in a bunch of colors now to match different cabinets. I also used a stain marker to color in some of the missing finish on the decorative pieces on the front of the drawers, my goal wasn't to have a showpiece as much as a working machine. I like how it looks now. There was a similar process cleaning up the head, going over it with sewing machine oil (after testing to make sure it doesn't harm the decals) to clean it, and working on the metal to remove rust and tarnish. I will post about this one of these days, as I have learned a bit more since the days I brought this machine home. A few things I like about this machine, notice how the treadle peddle sits to the left? The White has you sitting right in front of the needle, and also has a wider opening than some other machines (since I am a big girl I appreciate that). It takes a standard 15x1 needle, the kind you buy at the fabric store. It has a unique bobbin, but they are available pretty easily. There are modern reproductions that also fit, but some folks say they don't fit on the bobbin winder. I was lucky and got quite a few. The thing to look for when you buy a machine is if it has the teardrop shaped bobbin case. There is a picture in the manual I linked too. This case comes out easily and is often lost. My machine was missing one, and it took awhile to find one. Not impossible, but it took awhile. The other thing to get used to with the White FR is that the hand wheel turns backwards. This can take some getting used to, but becomes second nature after a bit. The threading system has a different type of tension than many other machines, but if you go through the steps in the manual it is pretty easy. Only a couple of months after I got this machine, I found another head in a thrift shop, it was electric with some scary wiring, but the decals were in much better condition. I have seen quite a few White FR machines since, in varying condition - there are tons out there so don't believe sellers telling you it is rare. I bought the new head home, took off the electric motor and swapped it into my treadle cabinet. This one was also dated to 1927, so it was a natural fit! 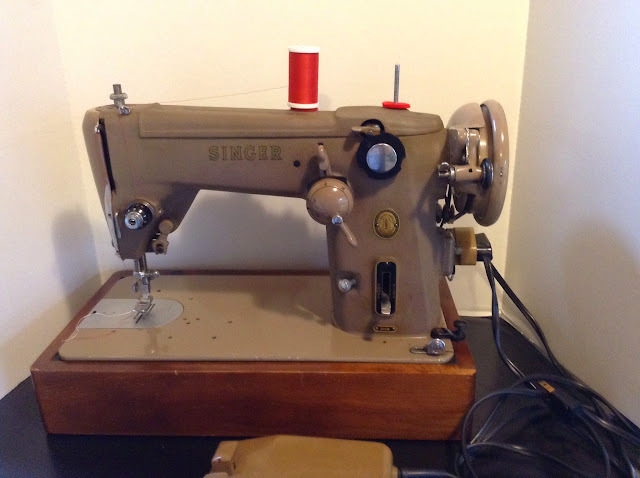 My first vintage acquisition - a Singer 306w Automatic Swing-Needle machine. When my nana passed away I asked for her sewing machine and matching cabinet. 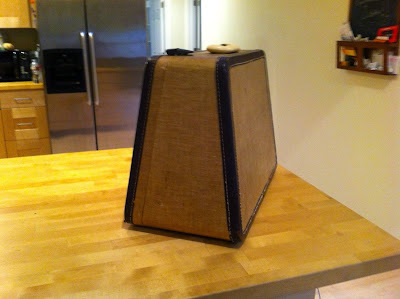 It was a Singer, but I don't even know what model, it was gold or bronze and used cams in the top to make fancy stitches. I used it for awhile, then along came children, several interstate moves and at least 20 years without any sewing projects. When I finally returned to sewing, thanks to a few weddings where our girls needed dresses, I bought a new machine, then another newer electronic one. For years I talked about taking nana's old Singer to a sewing machine repair shop and getting it tuned up and using it again. But I never got around to it, and when it came time to move again I (gasp) donated it. In a very short time I felt guilty, and even looked around town a bit to see if I could find it again with no success. About a year later my fancy electronic machine broke, and after an expensive repair job I was informed that it was only a "light duty" machine. This concept was foreign to me, as I grew up sewing whatever heavy or light projects I wanted on the mid-century machines just like everyone in my suburban neighborhood had. So I started reading about vintage sewing machines with the vague idea of looking for one. Not much later I saw an interesting trapezoid case in the back corner of an antique/junk mall. Inside was a tan Singer sewing machine! Not quite the same as nana's, but similar enough to make me think it might be the new heavy duty machine that I needed. The guys at the counter were so excited someone was buying it, they both started reminiscing about family members and telling me how wonderful old machines are. They insisted on plugging it in and showing me it ran, and the light worked. I got it home, and found out I now owned a Singer 306w, it had a manual and one cam. It had the typical fabric and pins on the arm, which I thought was quaint until I later learned that this set up causes "pin rash", scratching the machine under the fabric with all those sharp pointed pins. It was kind of terrifying that the guys had plugged it in and turned on the light, since the insulation on the wiring to the light was crumbling and falling off, exposing bare wire. The first thing I did was take the light off and hand it off to be re-wired. My handy husband eventually did get it done, but it was tricky and involved the purchase of snap ring pliers to get the fixture open. Just below the top picture is a tan one like mine. Lots of good info if you have or are looking at one of these. This photo is from when I put it up for sale. I had fun with cleaning it up and making it purr, but eventually decided it wasn't the machine for me. It was easy enough to buy the correct needles and bobbin online, so the fact that they weren't common wasn't that big of a deal. But the thing is heavy, and without a cabinet for it to live in, hefting it onto the dining room table to sew was a challenge. I didn't much care for tipping it back to change the bobbin, although I didn't find that a horrid idea as I tip machines back to oil them regularly. Future blog posts will describe what machines came next...and hopefully some things I have learned about cleaning etc. that you might find helpful when you find yours at a yard sale! My mom sewed. My Nana sewed. I took sewing in Home Ec classes in school. Every department store and Five & Dime store had a fabric department. During those years sturdy, well-built, easy to use sewing machines were the norm for home seamstresses. These machines were used for making everything from jeans, draperies, wedding dresses and bathing suits. Time has passed, life has changed. Fabric stores have closed, sewing machine companies were sold. Most towns now only have a chain store for fabric, or a small selection of quilting cotton in a craft store. Sewing machines are either cheap plastic wonders from a big box store, or expensive computerized marvels. All of those sturdy machines end up at garage sales and thrift stores - mostly being sold by folks who don't know how to sew. Often for a low cost and some oil and elbow grease you can end up with a great workhorse sewing machine. I can't rescue all of the machines out there, but I have brought home a few. I keep telling my sewing machine stories over and over in forums and when I meet folks, so I decided to start this blog and share some of my rescues with you.